First debuting in 2013, our Turbo Wheels have been THE wheel of choice for our World Champion Sk8Kings racing team. Offering traction, speed and predictable slide control - Turbos have helped our team riders to the podium in races worldwide ever since! Our latest SS (SuperSpeed) urethane formula kicks up the speed potential - while still maintaining that excellent grip quality our Turbos are known for. The composite glass core version offers similar benefits of the precision cnc aluminum hubbed Turbo wheel at a market-competitive price. The material blend of the composite hub results in a very solid bearing seat and promotes superior wheel alignment through critical turns. Our Turbo Wheels are an excellent choice for all racing disciplines as well as Turbo-charging your favorite ride. Our motto is "If you're grippin - your're rippin!" The Turbo Wheel line includes 70mm/75mm sizes Composite Core AND Aluminum Core versions. Turbo Wheels - like all Sk8Kings skateboard gear - are made right here in Southern California -- USA Proud! 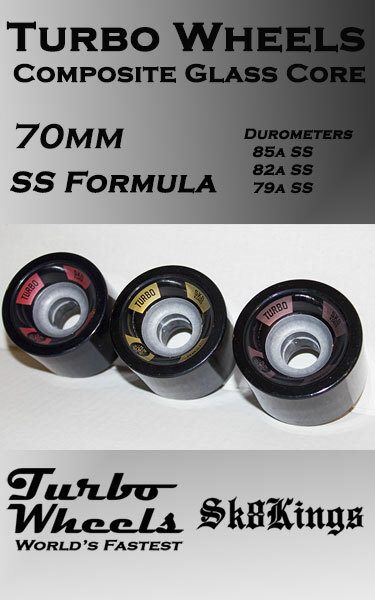 Bearing Recommendations: Turbo Composite Core Wheels are designed to work with traditional 8mm sized bearings. We recommend using high quality bearings (such as Oust Moc 5, 7 or 9) with steel bearing spacers (8mm x 10mm) for best performance. Be sure to carefully align bearings and press in straight. Turbo Composite Core Wheels / Stock Completes: Turbo Composite Core Wheels (70mm) come stock on all Sk8Kings Axe Series, Blaster and Mini-Shredder Completes -- Woody or Ultimate! Turbo Aluminum Core Wheels are an available upgrade for our complete builds. Turbo Aluminum Core Wheels debuted in 2013 -- taking the Sk8Kings team to the top of the podium in every major race since! Watch for Joe McLaren Signature Wheel - Coming Soon! !